Dzhokhar Anzorovich Tsarnaev (/ˌdʒoʊˈxɑːr ˌtsɑːrˈnaɪɛf/; born July 22, 1993)[note 1] is a Kyrgyzstani-American terrorist of Chechen descent who was convicted of planting pressure cooker bombs at the Boston Marathon on April 15, 2013, along with his brother Tamerlan Tsarnaev. The bombings killed three people and injured approximately 280 others. At the time of the bombings, Tsarnaev was a student at University of Massachusetts Dartmouth. Before attending UMass Dartmouth, Tsarnaev attended Cambridge Rindge and Latin School. Following the bombings, on April 18, there was a shootout between police and the Tsarnaev brothers. Tamerlan was killed and an MIT police officer was critically injured in the course of Tsarnaev's escape in an SUV. 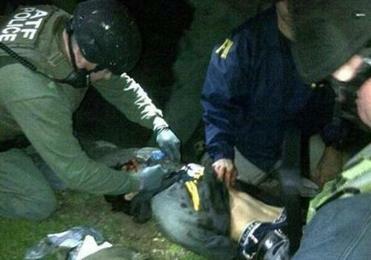 Tsarnaev was injured but escaped, and a manhunt ensued, with thousands of police searching a 20-block area of Watertown, Massachusetts. On the evening of April 19, the seriously wounded Tsarnaev was found unarmed hiding in a boat on a trailer in Watertown just outside the police perimeter, arrested, and taken to the hospital. Tsarnaev was charged on April 22 with using and conspiring to use a weapon of mass destruction resulting in death and with malicious destruction of property resulting in death. Tsarnaev later said during questioning that they next intended to detonate explosives in Times Square in New York City. Tsarnaev reportedly also said to authorities that he and his brother were radicalized, at least in part, by watching lectures by Anwar al-Awlaki. He was convicted on April 8, 2015, and sentenced to death on June 24, 2015. He and his family had traveled to the United States on a tourist visa and subsequently claimed asylum during their stay in 2002. He became a naturalized U.S. citizen on September 11, 2012. The Tsarnaev family was forcibly moved from Chechnya to the Soviet republic of Kyrgyzstan in the years following World War II. His father, Anzor Tsarnaev, is a Chechen, and his mother, Zubeidat Tsarnaeva, is an Avar. The couple had two sons, Tamerlan, born in the Kalmyk Autonomous Soviet Socialist Republic in 1986, and Dzhokhar, born in Kyrgyzstan in 1993. The parents also have two daughters, Bella and Aliana. Anzor is a traditional Muslim who shuns religious extremism and raised his children as Muslims. According to some, other Chechen Americans in the area apparently did not consider the American branch of the family to be "fully" Chechen because they had never lived in Chechnya. As children, Tamerlan and Dzhokhar lived in Tokmok, Kyrgyzstan. In 2001, the family moved to Makhachkala, Dagestan, in the Russian Federation. In April 2002, the Tsarnaev parents and Dzhokhar went to the United States on a 90-day tourist visa. Anzor Tsarnaev applied for asylum, citing fears of deadly persecution due to his ties to Chechnya. Tamerlan was left in the care of his uncle Ruslan in Kyrgyzstan, and arrived in the U.S. about two years later. In the U.S. the parents received asylum and then filed for their four children, who received "derivative asylum status". They settled on Norfolk Street in Cambridge, Massachusetts. Tamerlan lived in Cambridge on Norfolk Street until his death. Tsarnaev was born in Kyrgyzstan. As a child, he emigrated with his family to Russia and then, when he was eight years old, to the United States under political asylum. The family settled in Cambridge and became U.S. permanent residents in March 2007. He became a U.S. citizen on September 11, 2012, while in college. His mother, Zubeidat, also became a U.S. citizen, but it is not clear if his father, Anzor, ever did. Tamerlan, his brother, was unable to naturalize expeditiously due to an investigation against him, which held up the citizenship process. He attended Cambridgeport Elementary School and Cambridge Community Charter School's middle school program. At Cambridge Rindge and Latin School, a public high school, he was an avid wrestler, and a Greater Boston League winter all-star. He sometimes worked as a lifeguard at Harvard University. In 2011, he contacted a professor at UMass Dartmouth who taught a class about Chechen history, expressing his interest in the topic. He graduated from high school in 2011 and the city of Cambridge awarded him a $2,500 scholarship that year. His brother's boxing coach, who had not seen them in a few years at the time of the bombings, said that "the young brother was like a puppy dog, following his older brother". Tsarnaev enrolled in the University of Massachusetts Dartmouth in September 2011. He started with a marine biology major with the intent on becoming a dentist but later changed to nursing. Tsarnaev was described as "normal" and popular among fellow students. His friends said he sometimes smoked marijuana, liked hip hop, and did not talk to them about politics. Many friends and other acquaintances found it inconceivable that he could be one of the two bombers at first, calling it "completely out of his character". He was not perceived as foreign, spoke English without a [foreign] accent, was sociable, and was described by peers as "[not] 'them'. He was 'us.' He was Cambridge." On the Russian-language social-networking site VK, Tsarnaev described his "world view" as "Islam" and his personal priorities as "career and money". He posted links to Islamic websites, links to videos of fighters in the Syrian civil war, and links to pages advocating independence for Chechnya. Dzhokhar was also active on Twitter. According to The Economist, he seemed "to have been much more concerned with sport and cheeseburgers than with religion, at least judging by his Twitter feed"; however, according to The Boston Globe, on the day of the 2012 Boston Marathon, a year before the bombings, a post on Tsarnaev's Twitter feed mentioned a Quran verse often used by radical Muslim clerics and propagandists. In 2012, Arlington Police ran a warrant check on Tsarnaev and checked his green Honda when they were investigating a report of underage drinking at a party in Arlington Heights. At the time of the bombing, Tsarnaev was a sophomore living in the UMass Dartmouth's Pine Dale Hall dorm. He was struggling academically, having received seven failing grades over three semesters, including Fs in Principles of Modern Chemistry, Introduction to American Politics, and Chemistry and the Environment and had an unpaid bill of $20,000 to the university. He was known to be selling marijuana to make money. A triple homicide was committed in Waltham, Massachusetts, on the evening of September 11, 2011. After the 2013 Boston Marathon bombings, the case was re-examined, and authorities said the Tsarnaev brothers may have been responsible for the murders, that forensic evidence connected them to the scene of the killings, and that their cell phone records placed them in the area at the time of the killings. In May 2013, Ibragim Todashev, a 27-year-old Chechen native and former mixed martial arts fighter who knew Tamerlan Tsarnaev, was shot and killed in Orlando, Florida, by law enforcement officers who had been interviewing him about the Waltham murders as well as the bombings. The FBI has alleged that just before he was killed, Todashev made statements implicating both himself and Tamerlan Tsarnaev in the Waltham murders—saying that the initial crime was a drug robbery, and the murders were committed to prevent being identified by the victims. Dzhokhar Tsarnaev was convicted of participating, along with his brother Tamerlan Tsarnaev, in the 2013 Boston Bombing. He reportedly "told the FBI that [he and his brother] were angry about the U.S. wars in Afghanistan and Iraq and the killing of Muslims there." That day, Dzhokhar was captured on CCTV near the finish line pushing his way through spectators towards the front carrying a duffel bag which contained one of two pressure cooker bombs that would detonate. Tsarnaev appeared to place the bag down without causing any suspicion amongst spectators and then appeared to watch some marathon runners cross the finish line before hurrying away moments before the bomb exploded, causing mass panic among spectators and marathon runners. Shortly after the second bomb exploded, CCTV captured both Tsarnaev brothers running among the crowd away from the scene. Tsarnaev continued to tweet after the bombings, and sent a tweet telling the people of Boston to "stay safe." He returned to his university after the April 15 bombing and remained there until April 18, when the FBI released pictures of him and Tamerlan at the marathon. During that time, he used the college gym and slept in his dorm; his friends said that he partied with them after the attacks and looked "relaxed." Tsarnaev and his brother murdered MIT police officer Sean Collier on April 18 at the MIT campus in an attempt to steal his gun, before traveling to the Boston neighborhood of Allston. There, the brothers carjacked an SUV and robbed the owner. However, the owner of the car said he managed to escape when the Tsarnaevs became momentarily distracted in the process of refueling the car at a cash-only gas station. Dun Meng, who originally did not give his name to the media but said he goes by the name "Danny," said he fled to another nearby gas station and contacted the police. Police were then able to track the location of the car through the man's cellphone and the SUV's anti-theft tracking device. When police found the stolen SUV and a Honda being driven by the brothers in the early hours of April 19, the suspects engaged in a shootout with police in Watertown. During the gunfight, in which bombs were thrown at responding officers, Dzhokhar Tsarnaev was wounded while Tamerlan was shot a number of times before being apprehended. Police say that Dzhokhar escaped by driving the stolen SUV toward the officers who were arresting his brother. Although the officers managed to avoid being hit, Tsarnaev drove over Tamerlan, dragging him under the SUV about 30 feet (9 m) in the process (Tamerlan would later die at a nearby hospital). Tsarnaev reportedly sped off, but abandoned the car about 1⁄2 mile (800 m) away and then fled on foot. An unprecedented manhunt ensued involving thousands of police officers from several nearby towns as well as state police and FBI, and SWAT teams, who searched numerous homes and property inside a 10-block perimeter. Warrants were not issued, but residents reported they were told they must allow the searches to go forward. Many reported being instructed to leave their homes as well. Images of squad cars and large black armored vehicles crowding the sidestreets, and videos of residents being led out of their homes at gunpoint soon flooded social media. The Boston metro area was effectively shut down all day on April 19. After Tsarnaev's name was published in connection with the bombings, his uncle Ruslan Tsarni, who lives in Montgomery Village, Maryland, pleaded with Tsarnaev through television to turn himself in "and ask for forgiveness", and said that he had shamed the family and the Chechen ethnicity. During the manhunt for him on the evening of April 19, Tsarnaev was discovered wounded in a boat in a Watertown backyard, less than 1⁄4 mile (400 m) from where he abandoned the SUV. David Henneberry, the owner of the boat, had noticed that the cover on the boat was loose and when the "shelter in place" order was lifted, went outside to investigate. He lifted the tarpaulin, saw a bloodied man, retreated into his house and called 9-1-1. Three Boston police officers responded and were soon joined by Waltham police. Tsarnaev's presence and movement was later verified through a forward looking infrared thermal imaging device in a State Police helicopter. The suspect was observed pushing up at the tarp on the boat and Boston police began a large volume of gunfire at the suspect, stopping only after calls from the superintendent on the scene. After initial reports of a shootout between police and Tsarnaev, two U.S. officials said on April 24 that Dzhokhar was unarmed when captured. Tsarnaev, who had been shot and was bleeding badly from wounds to his left ear, neck and thigh, was taken into federal custody after the standoff. Initial reports that the neck wound was from a self-inflicted gunshot due to a possible suicide attempt were later contradicted by the revelation that he was unarmed at the time of capture and a description of the neck wound by SWAT team members that it was a slicing injury, possibly caused by shrapnel from an explosion. In an image broadcast on the night of his arrest, he was shown stepping out of the boat in which he had been hiding. Other sources described him "lying on his stomach, straddling the side of the boat (…) His left arm and left leg hung over the boat's side. He appeared to struggle for consciousness." Then he was "hauled down to the grassy ground" by a SWAT officer. In a photograph he can be seen lying on the ground on his back with his hands cuffed behind him, being helped by medical staff. He was taken to Beth Israel Deaconess Medical Center in Boston, where he was treated for severe injuries in the intensive-care unit. He was in serious but stable condition (updated to "fair" on April 23), and unable to speak because of the wound to his throat. According to one of the nurses, he had cried for two days straight after waking up. He responded to authorities in writing and by nodding his head, although he did manage to say the word "no" when asked if he could afford a lawyer. Court documents released in August 2013, show that Tsarnaev had a skull fracture and gunshot wounds prior to being taken into custody. According to a doctor that treated him, Tsarnaev had a skull-base fracture, with injuries to the middle ear, the skull base, the lateral portion of his C1 vertebra, with a significant soft tissue injury, as well as injury to the pharynx, the mouth, and a small vascular injury. Tsarnaev had written a message on the inside of the boat, reportedly saying "The [Boston] bombings were in retribution for the U.S. crimes in places like Iraq and Afghanistan [and] that the victims of the Boston bombing were collateral damage, in the same way innocent victims have been collateral damage in U.S. wars around the world." On April 26, Tsarnaev was transported by U.S. Marshals to the Federal Medical Center, Devens, a United States federal prison near Boston for male inmates requiring specialized or long-term medical or mental health care. He was held in solitary confinement in a segregated housing unit with 23-hour-per-day lockdown. Tsarnaev was the subject of a cover story for an August 2013 issue of Rolling Stone entitled "The Bomber: How a Popular, Promising Student Was Failed by His Family, Fell into Radical Islam and Became a Monster." The magazine drew large amounts of criticism for the flattering photo of Tsarnaev used for the issue's cover. Boston Mayor Tom Menino wrote that the cover "rewards a terrorist with celebrity treatment." Massachusetts State Police sergeant Sean Murphy stated that "glamorizing the face of terror is not just insulting to the family members of those killed in the line of duty, it also could be an incentive to those who may be unstable to do something to get their face on the cover of Rolling Stone magazine". The New York Times used the same photo on their front page in May 2013, but did not draw criticism. Rolling Stone columnist Matt Taibbi criticized those who took offense at the cover, arguing that their offense-taking was the result of their associating Rolling Stone with glamor instead of news, stating that The New York Times did not draw the criticism that Rolling Stone did, "because everyone knows the Times is a news organization. Not everyone knows that about Rolling Stone… because many people out there understandably do not know that Rolling Stone is also a hard-news publication." Hours after this happened, many retailers that sold the magazine, such as CVS Pharmacy, BJ's Wholesale Club (which additionally announced it will no longer sell any future Rolling Stone issues), and others, announced that they would no longer sell the issue. In December 2013, the Rolling Stone Tsarnaev cover was named the "Hottest Cover Of The Year" by Adweek magazine, with newsstand sales doubling from 60,000 to 120,000. The photo on the cover was taken by Tsarnaev himself, not a professional studio photographer. Initially, Tsarnaev was questioned without being read his Miranda rights, because the Justice Department invoked Miranda's public safety exception. He was to be questioned by a federal High-Value Interrogation Group, a special counterterrorism group created to question high-value detainees, which included members of the FBI, CIA, and Department of Defense. Later, after being read his Miranda rights, Tsarnaev stopped talking and declined to continue to cooperate with the investigation. Prosecutors initially argued for the public safety exception to be applied to the statements obtained before the Miranda rights were read. However, the exception was not considered by the court because the prosecutors later decided not to use any of that evidence in their case against Tsarnaev. On April 22, he was charged with "using and conspiring to use a weapon of mass destruction resulting in death" and with "malicious destruction of properties resulting in death", both in connection with the Boston Marathon attacks. He was read his Miranda rights at his bedside by a federal magistrate judge of the United States District Court for the District of Massachusetts, nodded his head to answer the judge's questions, and answered "no" when asked whether he could afford a lawyer. Once convicted, he was eligible to face the death penalty. He was prosecuted by assistant U.S. attorneys William Weinreb and Aloke Chakravarty, of the Anti-Terrorism and National Security Unit of the U.S. Attorney's Office in Boston. His defense team included federal public defender Miriam Conrad, William Fick, and Judy Clarke. Middlesex County prosecutors also brought criminal charges against Tsarnaev for the murder of Sean Collier. A surveillance camera at MIT captured the brothers approaching Collier's car from behind. Officials said, after initial interrogations, that it was clear the attack was religiously motivated, but that so far there was no evidence that the brothers had any ties to Islamic terror organizations. Officials also said that Dzhokhar acknowledged his role in the bombings and told interrogators that he and Tamerlan were motivated by extremist Islamic beliefs and the U.S. wars in Afghanistan and Iraq to carry out the bombing. Dzhokhar admitted during questioning that he and his brother were planning to detonate explosives in New York City's Times Square next. The brothers formed the plan spontaneously during the April 18 carjacking, but things went awry after the vehicle ran low on gas and they forced the driver to stop at a gas station, where he escaped. Dzhokhar says he was inspired by online videos from Anwar al-Awlaki, who also inspired Faisal Shahzad, the perpetrator of the 2010 Times Square car bombing attempt. Investigators have so far found no evidence that Tsarnaev was involved in any jihadist activities, and, according to The Wall Street Journal, now believe that unlike his brother Tamerlan, Dzhokhar "was never truly radicalized". Examinations of his computers did not reveal frequent visits to jihad websites, expressions of violent Islamist rhetoric or other suspicious activities. Some law enforcement officials told the WSJ that Tsarnaev "better fit[s] the psychological profile of an ordinary criminal than a committed terrorist". On May 16, 2013, during CBS This Morning, CBS News senior correspondent John Miller said he had been told that Tsarnaev wrote a note in the boat in which he was hiding and claimed responsibility for the April 15 attack during the marathon. The note was scribbled with a pen on one of the inside walls of the cabin and said the bombings were payback for the U.S. military actions in Afghanistan and Iraq, and referred to the Boston victims as collateral damage, the same way Muslims have been in the American-led wars. He continued, "When you attack one Muslim, you attack all Muslims." He also said he did not mourn his brother's death because now Tamerlan was a martyr in paradise and that he (Dzhokhar) expected to join him in paradise. Miller's sources said the wall the note was written on had multiple bullet holes in it from the shots that were fired into the boat by police. According to Miller during the interview he gave on the morning show, he said that the note will be a significant piece of evidence in any Dzhokhar trial and that it is "certainly admissible," and paints a clear picture of the brothers' motive, "consistent with what he told investigators while he was in custody". Tsarnaev's arraignment for 30 charges, including four for murder, occurred on July 10, 2013, in federal court in Boston before U.S. Magistrate Judge Marianne Bowler. It was his first public court appearance. He pleaded not guilty to all 30 counts against him, which included using and conspiring to use a weapon of mass destruction resulting in death. Tsarnaev was represented by Miriam Conrad, David Bruck, William Fick, Timothy G. Watkins and Judy Clarke. On January 30, 2014, United States Attorney General Eric Holder announced that the federal government would seek the death penalty against Tsarnaev. A plea deal failed when the government refused to rule out the possibility of the death penalty. The trial began on January 5, 2015; Tsarnaev pleaded not guilty to all thirty charges laid against him. The proceedings were led by Judge George O'Toole. Tsarnaev's attorney Judy Clarke admitted in her opening statement that Tsarnaev committed the acts in question, but sought to avert the death penalty by showing that his brother Tamerlan was the mastermind behind the acts. Counter terrorism expert Matthew Levitt also gave testimony. Bill and Denise Richard, parents of the youngest of the three killed in the bombings, urged against a death sentence for Tsarnaev. They stated that the lengthy appeals period would force them to continually relive that day, and would rather see him spend life in prison without possibility of release. Tsarnaev, who had displayed little emotion throughout his trial, appeared to weep when his relatives testified on May 4, 2015. On May 15, 2015, the jury recommended that Tsarnaev be sentenced to death by lethal injection on six of 17 capital counts. According to the verdict forms completed by the jurors, three of 12 believed that Tsarnaev had taken part in the attack under his brother's influence; two believed that he had been remorseful for his actions; two believed that Tamerlan, not Dzhokhar, had shot dead Officer Collier; three believed that his friends still care about him; one believed that Tsarnaev's mother, Zubeidat Tsarnaeva, was to be blamed for the brothers' actions; one believed that Tsarnaev would never be violent again in prison. Massachusetts ended the death penalty for state crimes in 1984. However, because Tsarnaev was tried on federal charges, he was eligible for execution. Tsarnaev's lawyer, Judy Clarke, indicated two lines of likely appeal: that on prejudicial grounds the trial should never have been held in Boston; and that the defense was given insufficient time to mount a full argument in mitigation that might have convinced the jury to spare Tsarnaev's life. The appeal process could last years or decades. On June 24, 2015, Tsarnaev faced his victims in court as his death sentence was formally imposed. Victims and their families were able to present impact statements to the court, and Tsarnaev, who had been silent throughout his month-long trial, apologized to the injured and the bereaved in the bombings. The following morning, on June 25, 2015, Tsarnaev was transferred to the United States Penitentiary, Florence High in Colorado; as of July 17, he had been transferred to ADX Florence. A Federal Bureau of Prisons (BOP) spokesperson stated that "unique security management requirements" caused the agency to place Tsarnaev in Colorado instead of United States Penitentiary, Terre Haute, Indiana, where male death-row inmates are normally held. According to The Guardian, in June 2016, Al-Qaeda leader Ayman al-Zawahiri issued a threat to the United States of the "gravest consequences" if Tsarnaev should be harmed. ^ Full list of charges: 18 U.S.C. § 2332a - Use of a Weapon of Mass Destruction and Conspiracy 18 U.S.C. § 2332f - Bombing of a Place of Public Use and Conspiracy; 18 U.S.C. § 844 (i) & (n) Malicious Destruction of Property and Conspiracy; 18 U.S.C. § 924(c) - Use of a Firearm During and in Relation to a Crime of Violence; 18 U.S.C. § 924(j) - Use of a Firearm During and in Relation to a Crime of Violence Causing Death; 18 U.S.C. § 2119(2) - Carjacking Resulting in Serious Bodily Injury; 18 U.S.C. § 1951 - Interference With Commerce by Threats or Violence; 18 U.S.C. § 2 - Aiding and Abetting; 18 U.S.C. § 981 (a) (1) (G) Forfeiture. ^ Amira, Dan (April 19, 2013). "28 Things to Know About Dzhokhar Tsarnaev, the Surviving Boston Bombing Suspect". New York Magazine. ^ a b c "United States vs. Dzhokhar Tsarnaev, Case 1:13-mj-02106-MBB Criminal Complaint (with FBI affidavit)" (PDF). United States Department of Justice. April 21, 2013. Archived from the original (PDF) on April 14, 2014. Retrieved May 3, 2015. Based on the foregoing, there is probable cause to believe that on or about April 15, 2013, DZHOKHAR TSARNAEV violated 18 U.S.C. § 2332a (using and conspiring to use a weapon of mass destruction, resulting in death) and 18 U.S.C. § 844(i) (malicious destruction of property by means of an explosive device, resulting in death). ^ a b c d e f Finn, Peter (April 19, 2013). "Tamerlan Tsarnaev and Dzhokhar Tsarnaev were refugees from brutal conflict". The Washington Post. Retrieved April 19, 2013. ^ "Dzhokhar Tsarnaev, Boston bombing suspect, was born in Kyrgyzstan, says minister". ndtv.com. New Delhi, IN: NDTV Convergence Limited. April 23, 2013. Archived from the original on March 28, 2014. Retrieved May 3, 2015. 'Only the younger of the two brothers, that is to say Dzhokhar, was born in Kyrgyzstan and was a Kyrgyz citizen,' Joomart Otorbayev, the first deputy prime minister of the former Soviet republic told US State Department officials during a meeting. ^ "Case 1:13-cr-10200-GAO Document 58 Filed 06/27/13." ^ Mathis-Lilley, Ben (March 19, 2015). "Massachusetts Will Prosecute Dzhokhar Tsarnaev for Killing of MIT Police Officer". slate.com. The Slate Group, a Graham Holdings Company. Retrieved December 18, 2016. ^ Engber, Daniel (April 19, 2013). "Pronounce Boston bomb names: Listen to recording of names of Dzhokhar Tsarnaev, Tamerlan Tsarnaev". slate.com. 95 Morton Street, 4th Floor, New York, NY, US: The Slate Group, a Graham Holdings Company. Archived from the original on February 23, 2014. Retrieved May 3, 2015. The following recordings come from a native speaker of Kyrgyz. Keep in mind that while Kyrgyz is a Turkic language, Chechen is from the Northeast Caucasian family of languages. ^ CNN Staff (April 22, 2013). "Timeline: A look at Tamerlan Tsarnaev's past". Cable News Network, cnn.com. Atlanta, GA, US: Cable News Network. Turner Broadcasting System, Inc. Archived from the original on February 3, 2014. Retrieved May 3, 2015. Hours later, investigators reveal that he and his 19-year-old younger brother are the marathon bombing suspects. ^ "Indictment against Boston bombing suspect". CNN. June 27, 2013. ^ a b "Boston bombing suspect charged". Al Jazeera English. Retrieved April 23, 2013. ^ O'Neill, Ann (April 8, 2015). "Tsarnaev guilty of all 30 counts in Boston bombing". CNN. Retrieved May 21, 2016. ^ Yuhas, Alan. "Dzhokhar Tsarnaev sentenced to death for Boston Marathon bombing – as it happened". The Guardian. ^ O'Neill, 1Ann; Cooper, Aaron; Sanchez, Ray (May 15, 2015). "Boston Marathon bomber Dzhokhar Tsarnaev gets death". CNN. ^ Schuppe, Jon (April 19, 2013). "Brothers' Classic Immigrant Tale Emerges as Relatives Speak Out". NBC NEWS. Retrieved October 8, 2016. ^ a b c Martin, Phillip (June 6, 2013). "Two Hours With Ruslan Tsarni, the Alleged Boston Marathon Bombers' Uncle". WGBH. Retrieved April 10, 2015. ^ Mong, Adrienne. "Boston bombing suspects' father 'a good man,' neighbors in Dagestan say". NBC News. Archived from the original on April 22, 2013. Retrieved April 22, 2013. ^ Balmforth, Tom (April 22, 2013). "'A Clear Setup': The Conspiracy Theory of the Boston Bombing Suspects' Father". The Atlanticl. Makhachkala. Retrieved April 22, 2013. ^ Cullison, Alan; Sonne, Paul; Troianovski, Anton; George-Cosh, David; 14 contributors (April 22, 2013). "Boston Marathon Bombings: Turn to Religion Split Bomb Suspects Tamerlan and Dzhokhar Tsarnaev's Home". The Wall Street Journal. Retrieved April 22, 2013. ^ a b c d Janet Reitman (July 17, 2013). "Jahar's World: He was a charming kid with a bright future. But no one saw the pain he was hiding or the monster he would become". Rolling Stone. ^ Keneally, Meghan; Farberov, Snejana (April 20, 2013). "Now, just tell them everything: Father of Boston bomber brothers speaks of his relief that his younger son is captured alive". Daily Mail. London. Retrieved April 21, 2013. ^ "Surviving Boston bombing suspect's mother and father to travel to the U.S. to visit their seriously injured son". Daily Mail. London. April 21, 2013. Retrieved April 21, 2013. ^ Radia, Kirit (April 20, 2013). "Boston Bomb Suspect Alarmed Russian Relatives With Extremist Views". ABC News. ^ Kaleem, Jaweed (April 19, 2013). "Boston Bombing Suspects' Muslim Identity Provides Few Clues To Motivation For Bombing". Huffington Post. Retrieved April 19, 2013. ^ Noronha, Charmaine (April 19, 2013). "Aunt says US suspect recently became devout Muslim". Huffington Post. Retrieved April 19, 2013. ^ Goode, Erica (April 19, 2013). "Brothers Seen as Good Students and Avid Athletes". The New York Times. Retrieved April 19, 2013. ^ "Timeline: A look at Tamerlan Tsarnaev's past". CNN. April 21, 2013. Retrieved April 21, 2013. ^ Sullivan, Eileen (April 19, 2013). "Manhunt in Boston after bombing suspect is killed". Associated Press. Archived from the original on December 12, 2013. Retrieved April 19, 2013. ^ "Agents Pore Over Suspect's Trip to Russia". The New York Times. April 29, 2013. ^ a b c d e Goode, Erica; Kovaleski, Serge F. (April 19, 2013). "Boy at Home in U.S., Swayed by One Who Wasn't". The New York Times. Archived from the original on July 14, 2013. ^ "Tamerlan Tsarnaev got Mass. welfare benefits". Boston Herald. April 24, 2013. Retrieved April 25, 2013. ^ Preston, Julia (April 20, 2013). "F.B.I. Interview Led Homeland Security to Hold Up Citizenship for One Brother". The New York Times. ^ "Dzhokhar Tsarnaev's friend: 'I really miss the person that I knew'". Masslive. April 29, 2015. Retrieved January 25, 2019. ^ Jared Lucky, "Months Before Marathon Bombing, Suspect Worked as Harvard Lifeguard", Harvard Crimson (April 19, 2013). ^ a b Russell, Jenna; et al. (April 19, 2013). "Two Brothers, Two Paths". The Boston Globe. ^ Coffey, Sarah; Wen, Patricia. "Bombing Suspect Attended UMass Dartmouth, Prompting School Closure; College Friend Shocked by Charge He Is Boston Marathon Bomber". Boston.com. ^ Matt Stout and Donna Goodison.Dzhokhar Tsarnaev loves pot, wrestling say friends," Boston Herald, April 20, 2013. ^ a b c Barney Henderson, "Boston Marathon bombs: suspect captured – April 20 as it happened,"
^ diBlasio, Natalia (April 19, 2013). "Details emerge on Boston suspect Dzhokhar Tsarnaev". USA Today. Retrieved April 23, 2013. ^ Williams, Matt (April 19, 2013). "Boston bombing suspect was 'a lovely, lovely kid'". The Guardian. London. Retrieved April 23, 2013. ^ Graff, Peter. "Boston suspect's Web page venerates Islam, Chechen independence". MSN. Retrieved April 21, 2013. ^ "After the marathon bombing: Terrible swift sword". The Economist. April 27, 2013. Retrieved April 28, 2013. ^ Curran, Kathy (April 15, 2013). "Marathon Bombing suspects stopped several times by law enforcement | Team 5 Investigates". Wcvb.com. Archived from the original on April 22, 2013. Retrieved April 24, 2013. ^ Chappell, Bill. "The Tsarnaev Brothers: What We Know about the Boston Bombing Suspects: The Two-Way". NPR. Retrieved April 20, 2013. ^ Schworm, Peter (May 4, 2013). "UMass-Dartmouth to establish independent task force to review policies". Boston Globe. ^ Mcphee, Michele (May 10, 2013). "'Mounting Evidence' Boston Bombers Involved in 2011 Triple Murder". ABC News. Retrieved May 14, 2013. ^ Schmidt, Michael S.; Rashbaum, William K.; Oppel, Jr., Richard A. (May 22, 2013). "Deadly End to FBI Queries on Tsarnaev and a Triple Killing". New York Times. Retrieved May 22, 2013. ^ "Dzhokhar Tsarnaev's Possible Motive: Anger Over Wars in Iraq and Afghanistan". Vanity Fair. ^ "Boston suspects: An immigrant journey that went off track". CNN.com. April 21, 2013. Retrieved April 20, 2013. ^ Yashwant Raj, "Boston Bomber Partied with Friends after Attack" Archived June 26, 2015, at the Wayback Machine, Hindustan Times, April 22, 2013. ^ Boston.com, On Allston block where carjacking took place, neighbors say they saw nothing April 26, 2013. Retrieved April 29, 2013. ^ Slane, Kevin (December 20, 2016). "Tsarnaev carjacking survivor Dun Meng on why he's sharing his story in 'Patriots Day'". Boston Globe. Retrieved January 31, 2019. ^ Walker, Adrian. "Carjack victim recounts his harrowing night". Boston. Retrieved April 28, 2013. ^ a b c Russell, Jenna; Farragher, Thomas (April 28, 2013). "102 hours in pursuit of Marathon suspects". The Boston Globe. Retrieved May 10, 2013. ^ "Boston bomb suspect captured, brother killed". NewsLeader. Retrieved April 27, 2013. ^ Harding, Ed (April 24, 2013). "Watertown boat owner David Henneberry tells story of finding Boston Marathon suspect". WCVB. Archived from the original on April 27, 2013. Retrieved April 28, 2013. ^ Brumfield, Ben (April 21, 2013). "In the end, Boston bombing suspect is done in by a flapping tarp". CNN. ^ Brian, Barrett (April 20, 2013). "The Crazy Accurate Thermal Images That Saw Dzhokhar Tsarnaev Through a Boat Tarp". Gizmodo. ^ Allen, Evan (April 23, 2013). "Boston police superintendent recounts officers' long search, tense final confrontation". The Boston Globe. Retrieved April 28, 2013. ^ Ngowi, Rodrique. "Officials: Suspect described plot before Miranda". ap.org. Retrieved April 29, 2013. ^ a b Dozier, Kimberley (April 25, 2013). "Officials: Suspect described plot before Miranda". AP/The Big Story. Retrieved April 25, 2013. ^ "102 hours in pursuit of Marathon bombing suspects - Metro - The Boston Globe". BostonGlobe.com. ^ "Inside Boston manhunt's end game". Ac360. April 22, 2013. Retrieved April 28, 2013. ^ "Photo of suspect caught on boat in backyard". CBS News. ^ "Images". Boston Globe. April 28, 2013. Retrieved May 24, 2013. ^ "Search of Tsarnaevs' phones, computers finds no indication of accomplice, source says". NBC News. April 23, 2013. Retrieved April 24, 2013. ^ "Boston bomb suspects 'planned more attacks'". Al Jazeera. April 21, 2013. Retrieved April 21, 2013. ^ Newcomb, Alyssa (April 21, 2012). "Authorities: Boston Bombing Suspect Is Responding to Questions in Writing". ABC News. Retrieved April 22, 2013. ^ Goldberg, Adam (April 21, 2013). "Boston Marathon Bombing Suspect Dzhokhar Tsarnaev Under Guard, Awaits Charges". Huffington Post. Retrieved April 21, 2013. ^ Barrett, Devlin. "Search for Dzhokhar Tsarnaev Over, Focus Shifts to Marathon Bombing Investigation". The Wall Street Journal. Retrieved April 21, 2013. ^ Associated Press. "For Boston Marathon Bombing Suspects, Question May Be Who Led Whom". SILive.com. Retrieved April 21, 2013. ^ "Accused Boston bomber had multiple wounds, fracture: court papers". Yahoo News. Retrieved August 20, 2013. ^ "Boston bombing suspect Tsarnaev had gunshot wounds to the mouth, extremities". NBC News. Retrieved August 20, 2013. ^ McGovern, Ray (May 17, 2013). "Boston Suspect's Writing on the Wall". consortiumnews.com. ^ Federal Bureau of Prisons Inmate Locator: Dzhokhar Anzorovi Tsarnaev, #95079-038. Viewed August 9, 2014. ^ Canada (April 24, 2013). "Boston bombing suspect Dzhokhar Tsarnaev moved from hospital to medical detention centre". Toronto: The Globe and Mail. Retrieved April 28, 2013. ^ "Boston bomb suspect in small cell with steel door - CBS News". CBS News. ^ "Dzhokhar Tsarnaev in Solitary at Devens' Segregated Housing Unit - TalkLeft: The Politics Of Crime". talkleft.com. ^ Ford, Beverly. "Boston Bombing Suspect Spends 23 Hours a Day Alone in Jail Cell". RIA Novosti. ^ Wolfson, John (July 18, 2013). "The Real Face of Terror: Behind the Scenes Photos of the Dzhokhar Tsarnaev Manhunt". Boston. ^ "Rolling Stone puts Boston bombing suspect on cover, ignites firestorm". CNN. July 18, 2013. Retrieved July 17, 2013. ^ a b "Explaining the Rolling Stone Cover, by a Boston Native". July 19, 2013. Retrieved April 23, 2014. ^ "Rolling Stone's controversial Dzhokhar Tsarnaev cover ignites heated debate". The Guardian. Retrieved August 30, 2013. ^ "BJ's Wholesale Club does not have the... - BJ's Wholesale Club". Facebook. Retrieved February 21, 2014. ^ "Several Stores Decide Not to Carry Rolling Stone Featuring Bombing Suspect". WGGB-TV. Archived from the original on July 21, 2013. Retrieved August 30, 2013. ^ "The Dzhokhar Tsarnaev 'Rolling Stone' Cover Won Adweek's 'Hottest Cover of the Year'". December 4, 2013. Retrieved April 23, 2014. ^ "Controversial Rolling Stone Tsarnaev cover named 'Hottest' of the year". December 11, 2013. Retrieved April 23, 2014. ^ Gandelman, Joe (July 17, 2013). "Does Rolling Stone Cover Glamorize Boston Bomber Dzhokhar Tsarnaev?". The Moderate Voice. San Diego, CA, US: The Moderate Voice. Archived from the original on July 25, 2014. Retrieved May 3, 2015. ^ a b Johnson, Luke (April 22, 2013). "Dzhokhar Tsarnaev Receives Miranda Rights after Delay for Public Safety Exception". Huffington Post. Retrieved April 23, 2013. ^ "Suspected bombers Dzhokhar Tsarnaev, Tamerlan Tsarnaev, plot difficult for law enforcement to detect". Bloomberg. April 21, 2013. Retrieved April 21, 2013. ^ Kaleem, Jaweed (April 20, 2013). "Boston Bomber Suspects Had Attended Cambridge Mosque, Officials Say". Huffington Post. Retrieved April 21, 2013. ^ "'We Got Him! ': Boston Bombing Suspect Captured Alive". NBC News. April 21, 2012. Retrieved April 20, 2013. ^ Sari Horwitz, Jenna Johnson and Kathy Lally (April 22, 2011). "Dzhokhar Tsarnaev Charged with Using 'Weapon of Mass Destruction'". The Washington Post. Retrieved April 23, 2013. ^ Markon, Jerry; Horwitz, Sari; Johnson, Jenna (April 23, 2013). "Dzhokhar Tsarnaev Charged with Using 'Weapon of Mass Destruction'". The Washington Post. Retrieved April 23, 2013. ^ "Boston Bomb Suspect Gets Public Defender as Charges Loom". Bloomberg. ^ Rozen, Laura (April 29, 2013). "Justice for Dzokhar Tsarnaev — and the Rest of Us". The Jewish Daily Forward. ^ "Prominent death penalty lawyer Judy Clarke appointed for Boston Marathon bombing suspect". Yahoo! News. Associated Press. April 29, 2013. ^ Feathers, Todd (April 25, 2013). "Middlesex County prosecutors building murder case against Dzhokhar Tsarnaev in officer's slaying". Boston.com. Archived from the original on April 26, 2013. ^ "Source: Suspects in Boston Marathon Bombings, Dzhokhar Tsarnaev and Tamerlan Tsarnaev, Motivated by Religion". Newsday. April 16, 2013. Retrieved April 23, 2013. ^ "Bombers 'motivated by religion'". 3 News NZ. April 23, 2013. ^ Cooper, Michael; Schmidt, Michael S.; Schmitt, Eric (April 23, 2013). "Boston Suspects Are Seen as Self-Taught and Fueled by Web". The New York Times. Retrieved February 21, 2014. ^ Wilson, Scott; et al. (April 23, 2013). "Boston bombing suspect cites U.S. wars as motivation, officials say". The Washington Post. Retrieved April 23, 2013. ^ Pearson, Michael (April 23, 2013). "Official: Suspect says Iraq, Afghanistan drove Boston bombings". CNN. Retrieved April 23, 2013. ^ Brumfield, Ben; Levs, Josh (April 25, 2013). "Boston bombing suspects planned Times Square blasts, NYC mayor says". CNN. Retrieved April 25, 2013. ^ McElroy, Damien (May 7, 2010). "Times Square bomb suspect had links to terror preacher". Telegraph. London. Retrieved September 23, 2013. ^ "Boston bombings suspect Dzhokhar Tsarnaev left note in boat he hid in, sources say". CBS News. Retrieved May 16, 2013. ^ "Suspect: Boston payback for hits on Muslims". CNN. May 17, 2013. Retrieved May 16, 2013. ^ "Bombing suspect left note inside boat". WPRI TV. Archived from the original on May 22, 2013. Retrieved May 16, 2013. ^ MacDonald, G. Jeffrey; Bacon, John (July 10, 2013). "Tsarnaev pleads not guilty". USA Today. McLean, VA, US: Gannett Satellite Information Network, Inc. Retrieved May 4, 2015. Boston Marathon bombing suspect Dzhokhar Tsarnaev, appearing disheveled and fidgety, pleaded not guilty Wednesday to 30 counts of using a weapon of mass destruction stemming from the Boston Marathon bombing. ^ McPhee, Michele; Haskell, Josh; Radia, Kirit (July 10, 2013). "Accused Boston Marathon Bomber Dzhokhar Tsarnaev Smiles in Court, Pleads Not Guilty". ABC News, abcnews.go.com. Burbank, CA 91521, US: ABC News Internet Ventures (The Walt Disney Company). Archived from the original on March 27, 2015. Retrieved May 4, 2015. Accused Boston Marathon bomber Dzhokhar Tsarnaev smiled and, at one point, appeared to smirk during a hearing today as he pleaded not guilty to all 30 counts against him. ^ Goldman, Adam; Horwitz, Sari (January 30, 2014). "U.S. to seek death penalty in Boston bombing case". The Washington Post. 1150 15th Street NW, Washington, DC 20071, US: WP Company LLC. Retrieved May 4, 2015. 'The nature of the conduct at issue and the resultant harm compel this decision,' Attorney General Eric H. Holder Jr. said in a short statement. ^ Martinez, Michael (January 2, 2015). "A tale of two Tsarnaevs on eve of trial in Boston Marathon bombing". Cable News Network, cnn.com. Atlanta, GA, US: Cable News Network. Turner Broadcasting System, Inc. Archived from the original on April 23, 2015. Retrieved May 4, 2015. Jury selection is scheduled to begin Monday in a trial that could last months. ^ BBC Staff (January 6, 2015). "Boston bombing: Jury selection begins in Tsarnaev case". BBC Online. Portland Place, London, England, UK: BBC. Archived from the original on May 4, 2015. Retrieved May 4, 2015. Jury selection alone is expected to take several weeks as Judge George O'Toole selects 12 jurors and six alternates from about 1,200 prospective jurors who have been summoned to the court in Boston. ^ O'Neill, Ann (April 8, 2015). "Tsarnaev guilty of all 30 counts in Boston bombing". Cable News Network, cnn.com. Atlanta, GA, US: Cable News Network. Turner Broadcasting System, Inc. Archived from the original on April 25, 2015. Retrieved May 4, 2015. From start to finish, it took 26 minutes for the jury to announce its verdict in the Boston Marathon bombing trial: Tsarnaev didn't skate on a single charge. He now stands guilty of all 30 counts, 17 of which could send him to death row. ^ BBC Staff (April 17, 2015). "Boston bombing: Parents of youngest victim oppose execution". BBC Online. Portland Place, London, England, UK: BBC. Archived from the original on April 18, 2015. Retrieved May 4, 2015. The parents of youngest victim in the Boston marathon bombing have called on federal authorities to drop the death penalty as a possible punishment for bomber Dzhokhar Tsarnaev. ^ Seelye, Katharine Q. "Dzhokhar Tsarnaev Gets Death Penalty in Boston Marathon Bombing". The New York Times. The New York Times, May 15, 2015. Web. May 18, 2015. ^ "Boston Bombing Trial: Death Sentence for Dzhokhar Tsarnaev". BBC News. N.p., May 16, 2015. Web. May 18, 2015. ^ Erica Hellerstein. "Jurors In The Boston Bombing Case Had To Agree To Consider The Death Penalty Before Being Selected". ThinkProgress, May 16, 2015. Web. May 18, 2015. ^ Winter, Tom, Andy Thibault, and Jon Schuppe. "Tsarnaev Sentenced to Death in Boston Bombing Trial". NBC News. N.p., n.d. Web. May 18, 2015. ^ Ann O'Neill; Aaron Cooper and Ray Sanchez; CNN (June 24, 2015). "Boston bomber Dzhokhar Tsarnaev says he's sorry". CNN. ^ "Boston Marathon bomber Dzhokhar Tsarnaev transferred to Colorado prison". June 25, 2015. ^ Dzhokhar Tsarnaev transferred to Supermax prison, Milton J. Valencia, Boston Globe, July 17, 2015. Accessed on line July 20, 2015. ^ "Why Tsarnaev was not sent to Terre Haute". WTHI-TV. June 26, 2015. Archived from the original on December 22, 2015. Retrieved December 13, 2015.